Lions win battle of the Big Cats! On a day when the Lions could easily have notched double-figures, they still managed more than enough to see them past promotion rivals Saltdean United. A series of early Saltdean corners all came to nothing and both sides created several half-chances, none of which were converted before the Lions started to take complete command. Inevitably it was Pagham top-scorer Dan Simmonds who gave his side the lead after 24 minutes, when he was first to react to a high, spinning deflected shot to smash home from 5 yards. And Simmonds could have had his and Pagham’s second after 32 minutes when he just failed to get his toe to a James Thurgar flick across goal. More than a few Lions attacks were negated by the offside flag before Simmonds wasted two excellent chances in time added on at the end of the first half. Firstly, he drove his shot high, wide and handsome and then, second time around, he shot well wide of the target, both times having been put clear, and onside, one-on-one with Tigers keeper, Rikki Banks. As the whistle went for half-time Simmonds left the field with his head held low in sheer disbelief. The second half started with another couple of chances for the Lions top-scorer, both saved by keeper Banks, the first at the striker’s feet and the second pushing away a fierce drive from the edge of the box. On 55 minutes Simmonds finally got his name on the scoresheet once again after a crisp Pagham move from one end to the other. Ryan Davidson won the ball in defence and hit a long ball down the right wing for Callum Overton to chase. His excellent cross was hit onto the post by James Thurgar and Simmons, following up, had the simple task of putting the ball into the net for a 2-0 lead. Two minutes later it was 3-0 when another excellent cross by Overton was converted with some panache at the far post by Thurgar. Pagham keeper James Binfield was forced into his first real save in the 74th minute when he managed to clear an excellent low drive from Saltdean’s Lucas Franzen-Jones and despite three late substitutions by the Lions the game looked like it was petering out at 3-0. Pagham were having none of it though and the excellent Lloyd Rowlatt (twice) and sub Kieron Playe-Howard could have added to the total before the final whistle went. 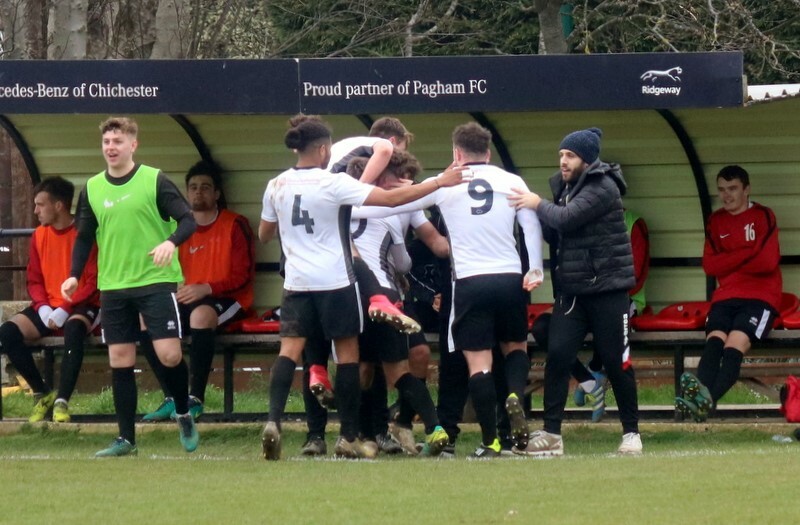 Pagham’s Team was: James Binfield, Shay Wiggans, Daryl Wollers, Ryan Davidson, Joe Booker, Jamie Horncastle (Joe Kilhams), James Thurgar (Tom Jefkins), Andy Chick, Dan Simmonds (Kieron Playe-Howard), Lloyd Rowlatt and Callum Overton. Subs not used, George Bingham and Johan van Driel.